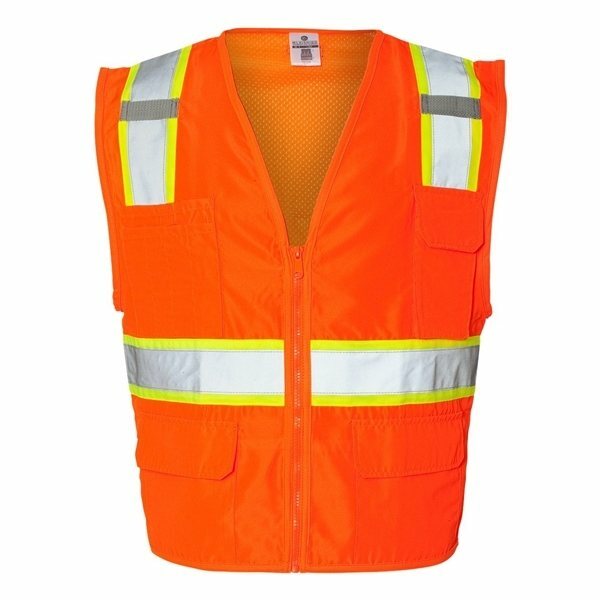 This vest has your back in comfortable Ultra-Cool™ mesh with reflective safety tape. Ultra-Cool™ mesh back and solid front. 2" wide silver reflective materials with 3" contrasting color. Two outside patch pockets with flaps. Right chest two-division pencil pocket. ANSI/ISEA 107, Class 2 compliant. Printed very nice and the color selection was made properly. I appreciate the customer service rep's suggestion. Customers really like them. We've got plenty of comments so far. the items came out well. Our representive was helpful. these are a hit on sales calls, impressive and well done. We will not hesitate to order from you again for things like this. The price was very affordable. Pricing and logo turned out very nicely.